How can a garden be so famous yet so little understood, be so vulgar and so magnificent at the same time, and be a symbol of overwhelming power yet so ravishingly intimate? Versailles somehow manages to be all of these things. 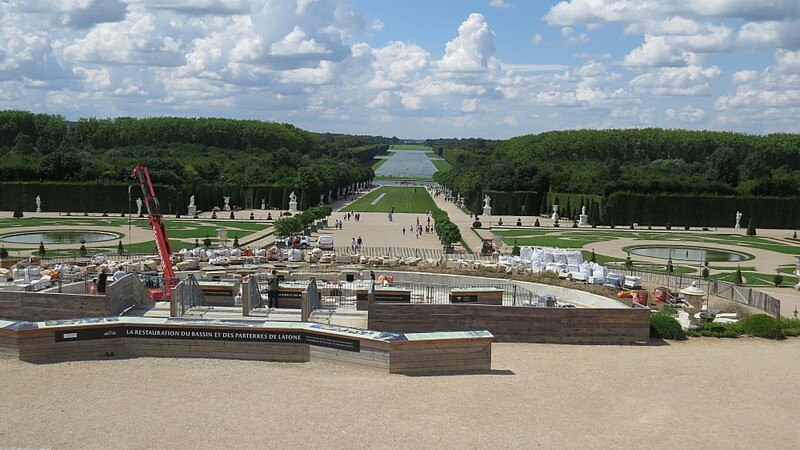 I, like many of the visitors who glanced down the main axis of the garden of Versailles for the first time found it breathtaking, intimidating, and a display of overwhelming power. This is exactly what was intended, it was designed as a stage set to glorify Louis XIV, the personification of France. Here nature is subjugated to within an inch of its life on a truly colossal scale and mankind seems irrelevant. I was curious to find out how this amazing creation came to be built. 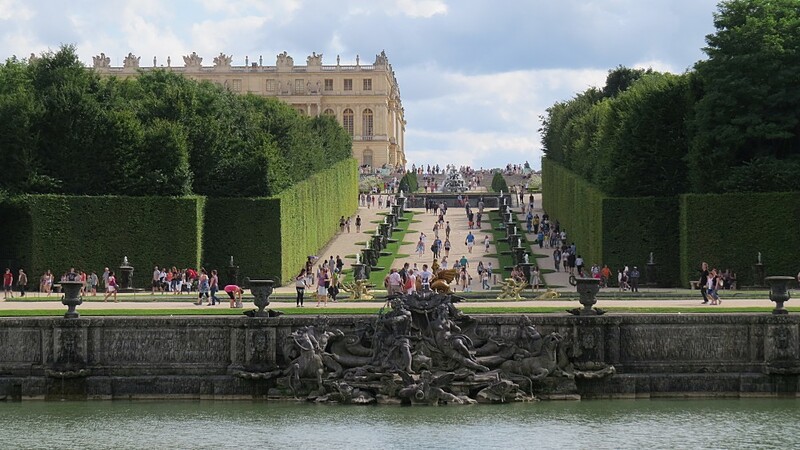 It is not possible to separate Louis XIV’s Versailles from the events that led up to its conception. I think it is likely that Louis was traumatised by the Fronde, a civil war that started when he was ten and set princes, nobility, parlements and most of the French people against the king. Some five years later, the king’s party had crushed all opposition creating an absolute monarchy and centralised state, but this had not been a foregone conclusion. The military were reorganised under Louis’s direct control and he was able to exercise autocratic power over the most powerful country in Europe. The people of Paris had sided against the king, and Louis loathed this grimy, stench-filled, disease-ridden city with its volatile population almost as much as he hated the impersonal Louvre, his main palace. When in 1661 his godfather and first minister Cardinal Mazarin died, Louis at the age of 23 decided he would rule France himself rather than leave it to a council of ministers, and that he would move his capital to his father’s hunting lodge at Versailles. The new Palace of Versailles would be the centre of all power, and princes, nobles, ministers and their retinues would be required to be in attendance under his scrutiny and direct control. 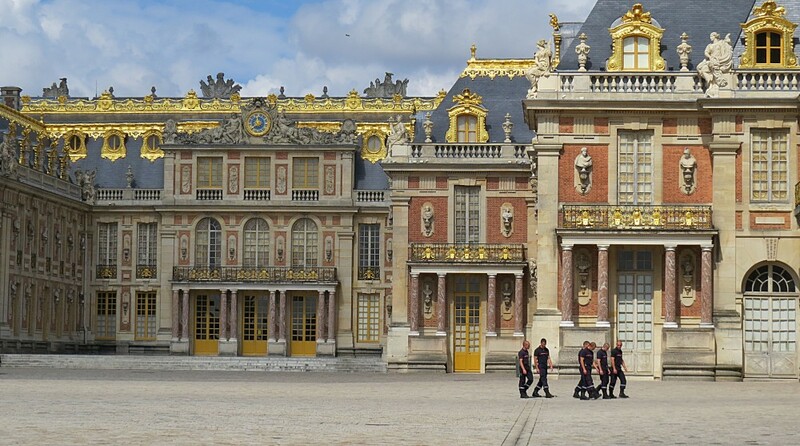 Taking 50 years to complete but official seat of government from 1682, the palace was the size of a small city accommodating 20,000 people, the town of Versailles growing up to service the needs of the palace. Believing in the divine origin of the monarchy, Louis saw himself as a demi-god, and identified with Apollo, the god of light, sun and reason. He, the Sun King, was the centre of France which artistically and culturally was the centre of the European universe. 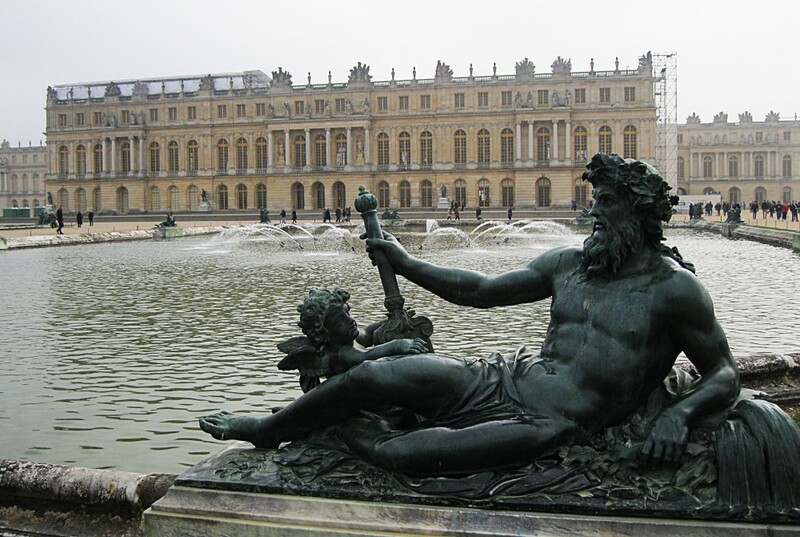 He employed the greatest French architects, artists and sculptors of his day to create a lavish palace on such a scale that it would intimidate and astonish all who saw or heard of it. But such an astounding palace needed an equally breath-taking setting, and the king’s landscape gardener Andre Le Notre was to provide that. Louis had seen the first major project of Le Notre at the Chateau of Vaux de Vicomte in 1661 and immediately appointed him to lay out the landscape of Versailles, but on a far grander scale. How well the brilliant design of Vaux de Vicomte translates into the colossal size of Versailles I think is questionable, but all the same optical illusions, subtle surprises, use of still mirrors of water, and cleverly balanced asymmetry are to be found here. 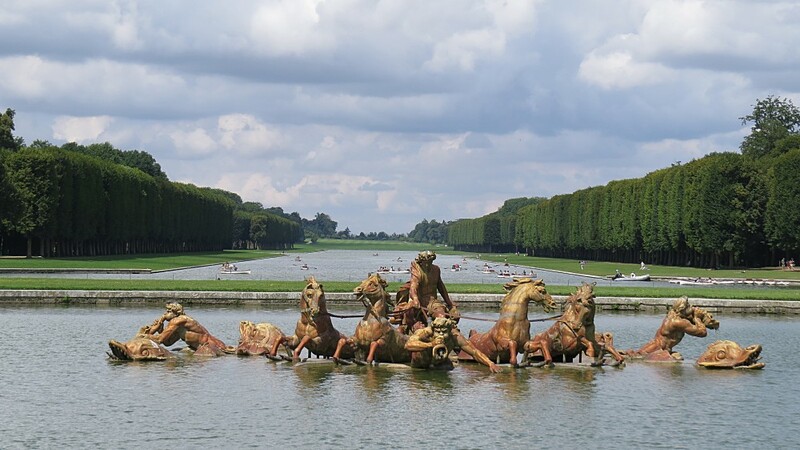 The great fountains and displays of water are what bring Versailles to life, and surprisingly the spectacularly beautiful and intimate grove gardens (bosquets) are largely overlooked by visitors. 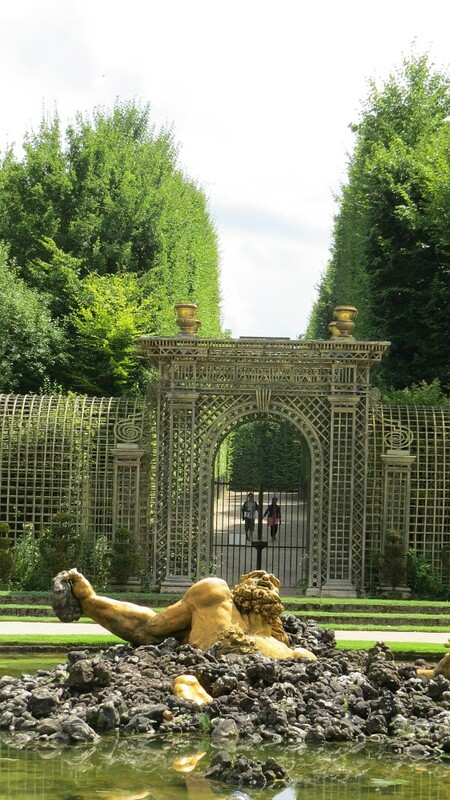 It was not until last year, losing myself in the labyrinth of hornbeam walls that enclose the bosquets that I stumbled across the locked gates of Le Notre’s open-air ballroom, and the Enceladus Grove. Here was the counterbalancing intimacy that had been missing from the main garden. It was a revelation to me showing Le Notre to be a brilliant designer of stunningly beautiful small-scale spaces as well as of grand landscapes. Wishing to escape the stultifying court etiquette, his ministers and endless supplicants, Louis bought the modest adjacent village of Trianon, raised it to the ground and built the Grand Trianon, a single storey mansion in sugared almond pink and grey marble which lacks the muscularity of the architecture of the palace. To my mind, this is Louis’s taste at its most dubious, and would not be out of place in Beverley Hills with a white stretch limo parked out front. 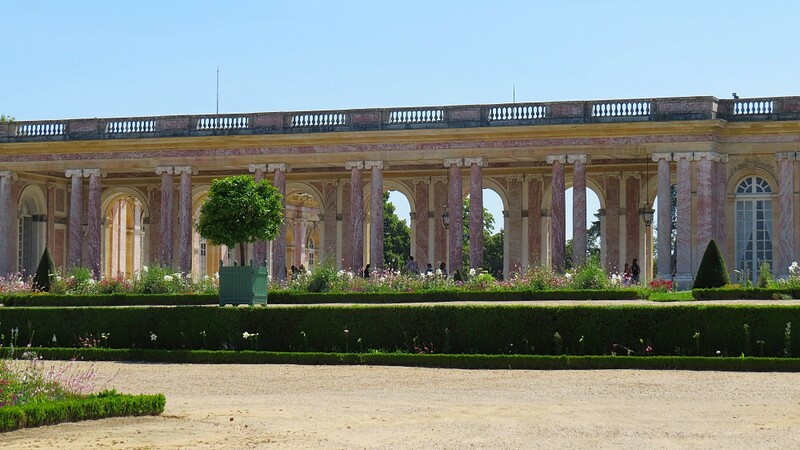 Here Louis had something of a home life and in the garden parterres he was able to indulge his passion for flowers on an appropriately massive scale. 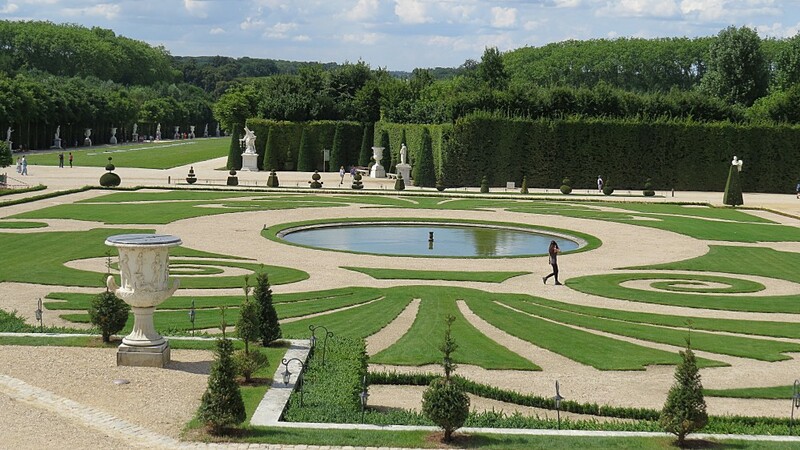 Like it or loathe it, Versailles demands your attention and submission like no other garden. It is one of a small handful of gardens that are so iconic that all others are measured against them. The great vision that Louis created for himself and for France has ensured its survival despite the background of a turbulent French political history. Do I like it? Louis’s contemporary, the free-thinking libertarian French philosopher Voltaire described it as ‘a masterpiece of bad taste and magnificence’. I couldn’t agree more.